For many, each new year comes with resolutions. These are typically about health and well being. How about some for genealogy? Since we are at the end of January, you need only do 11 to cover the rest of the year. The first step is to define your current genealogical goals. You might be looking into one branch of the family, trying to find immigrants place of origin or make progress on a lineage society application. Make a list of your goal for each month. To organize your efforts, and keep track of what you did and did not find, consider using a Research Log. You can learn more about them at the Family Search Wiki https://www.familysearch.org/wiki/en/Research_Logs or even take view an online class about them https://www.familysearch.org/ask/learningViewer/45. Once you have made a list of your goals, consider how large each is. For larger goals, you will probably want to divide them into subgoals for a month and choose from one category to complete. 1. Write. Document your own life. Collect the documents that prove who you are and your relationships. Compiling a timeline of your life events would be great. Or choose to write about an ancestor you have researched. Include all the data you have found and all the family stories. Writing about an ancestor gives a product to share with your family. It also sheds light on the gaps in your research. 2. DNA. Spend some time thinking about the use of DNA in your genealogical research. Consider taking a DNA test. There are definitely privacy concerns that you will want to consider. If you decide to test, consider getting family members on both your maternal and paternal sides. If you have already taken a test, do something to organize your matches. For those who tested at Ancestry.com, the manual Leeds method may help. There are a large number of automated clustering tools to investigate. 3. Learning. Learn about an ethnic group and its migration and records. Learn about using a set of records or a subscription service. Learn about genealogical research in a state or county. There is a lot to learn, so there may be different learning goals over the year. Remember that the best way to retain what we have learned is to apply what you learn as soon after the class as you can. Classes about many topics can be found on FamilySearch Learning Center. Some Legacy Family Tree Webinars are free for a week after they are originally aired. They offer subscriptions, and individual webinars can be purchased. Ancestry.com has a YouTube video channel to learn about research techniques and find out about their new collections. Search YouTube for videos about topics that relate to your research. There are classes and lectures. There are videos about genealogy tools and how to use them. There are tours of locations. Depending on your cable provider, you may find that you have access to YouTube on a channel. While the YouTube interface on FIOS is awkward, watching the video on a larger TV screen can be good. 4. Podcasts. Do you listen to genealogy podcasts? Have you searched iTunes for new genealogy podcasts? I never miss an episode of The Genealogy Guys Podcast. There are a bunch of others out there to enjoy! 5. Gather. Go to a genealogical event in person. This could be a meeting of a local society or a regional or national conference. 6. What’s at the Library? You can visit and ask. Most libraries have a website where you can find out what resources they access. You might find that your library card can unlock HeritageQuest, Fold3 or other resources for home use. The Library Edition of Ancestry.com usually requires you go to the library to use it. Also look for libraries in your ancestors’ regions. 7. An Electronic Family Tree. Think of it as organizational step. It is great to have all the paper, but having it all electronically lets you print out forms and reports more easily. Capture data, scans of records and images you find in this electronic family tree. Decide if you want a tree on your own computer or online. You might want both, so look at software that synchronizes the trees. Needless to say, this will probably be a larger project, so set up subgoals by branches or groups of family. This reminds me of housecleaning, which is something that can be hard to get excited about doing, but the results make you feel better. In fact, my Mother used to recommend cleaning when you felt low because you will have something to show for the time. What if… ? Relax! You may not complete a monthly goal, or find you want a goal to spill into the next month. You may want to skip a monthly goal to do something more promising. You may not have time that month to do what you planned. It’s your list! It’s fluid! 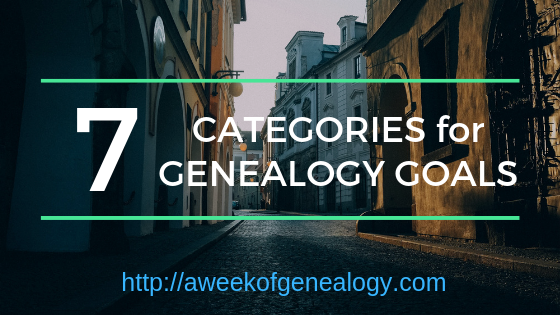 If you can devote a weekend to each goal, or even a day per month, you can get closer to your genealogical goals. You will find that having (changeable) goals will get you closer.